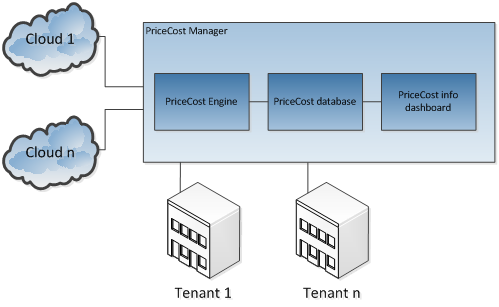 Atos, as part of the work on CloudWave project, is developing the PriceCost Manager. It is a system able to calculate and visualize the costs and price from a specific application that has been deployed in a cloud. Multi-tenant applications are deployed in the clouds, therefore, all the system has to be thought in a multi-tenant way. We also want to design a system that is able to handle the cost of several cloud platforms as it has been depicted in Figure attached. The tendency is to have federated cloud and or work with different cloud management platforms. PriceCost Engine: it is the core component where the cost is calculated. It will need to keep the information of physical machines, virtual machines in order to calculate the cost and price of an application. It will be designed as a skeleton where the data useful for price or cost calculation is captured and where different kind of price or cost algorithms can be programmed and configured through plugins. PriceCost database: persistence is done in a relational and non-relational database. Information about the infrastructure, tenant, and cloud is recorded in a relational database (MySQL). Information about the price and cost is recorded in a non-relational database (Elasticsearch). PriceCost info Dashboard: Kibana is used to visualize the information. It can be used to graphically represent the evolution from the price and the cost from the different elements like the tenant, cloud manager, physical machine, virtual machine, etc. More information about PriceCost Manager can be found in Deliverable D.4.1.2. Coordinated Adaptation: Year 2 Report.